Here’s my attempt to put together the list of things I expect to happen to Cloud Computing in 2009 – kind of natural thing to do the fist day of the year, right? Overall, this is going to be a year when cloud computing will start rapidly maturing with competition heating up on the infrastructure/platform level, real private cloud solutions hitting the market, traditional applications increasingly moving to SaaS or hybrid model, and browser offline becoming a reality. Let’s go through these one by one – and go through the IaaS and PaaS markets first. Platform and Infrastructure as a Service (PaaS and IaaS) markets maturing and blurring. IaaS is basically Amazon EC2 approach with hosters giving customers the ability to instantiate and control virtual machines running in the datacenter. This is a natural progression from the traditional server hosting model. However, this model of raw VM does not provide a lot of opportunity to differentiate which in turn is leading to higher competition and lower profit margins. We will see more and more platform functionality being added to infrastructure offerings and these two layers merging more and more. Amazon is clearly adding more and more services besides EC2, and partners such as RightScale are adding automated scaling features normally associated with PaaS. Even newcomers are now often shooting for something in between right from the get go. Can you tell where Windows Azure is? It is already kind of both infrastructure and platform. Speaking of Windows Azure, this is likely going to be the year when it will hit the market. Folks at Microsoft are doing their best to make it easier for existing software ecosystem to get in with effectively the same or very similar tools they use today. The sheer size of the ecosystem, and this evolutionary approach is likely to immediately make Microsoft a serious player in the space. Their hosting partners can compete effectively against Amazon, Microsoft, Google, and others. They don’t end up being behind competition by limiting themselves to basic infrastructure only. The interesting aspect of that is that VMware really has the potential of forcing Microsoft to let partners run Azure. Today this is not the case and the only place where Azure exists is Microsoft’s datacenter. It remains to be seen whether pure Platform as a Service players such as Salesforce.com (with its Force.com) and Google App Engine will be in the leaders group. They will likely start feeling pressure from the infrastructure level as I mentioned already but it might be challenging for them have the ease of migration and the flexibility that IaaS solutions have. Also, Google seems to be making surprisingly small progress lately. They have posted some information on the upcoming System Status site and billing/quota dashboard – which means that the beta status is likely to be gone soon. However, their development story (Python as the only programming language and quite limited development environment) and the economy forcing them to concentrate on their core search and ad business are limiting their ability to compete. Thoughts, comments on any of these? I will continue with other trends next week. Peter Nickolov – President & CTO of 3tera – gave a pitch on how their technology (AppLogic) lets customers use cloud computing for high-availability solutions. In a nutshell, Peter had an instance of SugarCRM which in his demo could fail-over from one datacenter to another. No changes in the code were required everything was set in the configuration of the application and AppLogic: he copied the application (front-end machines, back-end machines, load-balancers, etc.) to another cloud and set MySQL replication between them. Then when one application goes down their load-balancers detect unavailability of the primary site and give the IP address to the secondary one. Peter said it took a couple of days to set up the demo. Obviously, SugareCRM was a relatively easy target because all the state information is in a single database, so MySQL replication was sufficient to have the application ready for the hot switch. But nevertheless this was a pretty impressive demo of how AppLogic’s building blocks can provide the additional layer of management and datacenter independence you might want to have with your hosters. Andrew Comas from CORDYS gave a fairly boring general session on their Process Factory product – basically some kind of mesh-up editor for corporate use. VMware had 2 sessions that day – by Dan Chu (Vice President of Emerging Products and Markets – which at VMware includes everything from overseeing the SMB space, to virtual appliances, to cloud computing) and by Preeti Somal (Vice President R&D Cloud Computing). Basically, these were a pitch for the upcoming vCloud solution. The basic idea is actually very close to what we get from 3tera and rPath: the cloud is just a set of virtual machines, let’s make them standardized across the datacenters and provide administrators the ability to manage them as a system – and we got a great flexible solution without a hosting vendor lock-in. Today, they have their existing on-premise Virtual Infrastructure which a lot of us are using in our companies. In addition to that they have over a 100 hosting partners committed to providing this infrastructure in their datacenter – thus providing the flexibility to choose the hosting vendor. Next year we will start getting into the second phase – so called “vCloud Services”: which basically means that we will get OVF-based way of grouping virtual machines into systems together with associated policies. And we might get a few sample solutions like the “flex capacity” scanario which was demoed during the VMWorld keynote in September. Finally, they will provide full Virtual Center integration so you can manage your VMs in one console regardless of whether they are deployed in your network or by a hoster (they are calling that Federation) and more advanced architecture capabilities. It is yet unknown how much will vCloud move beyond just VMs into additional services such as message queuing to VM interaction, storage and so on. They are saying that some of the infrastructure will be provided (for example load balancing) but not everything because they want to stick to creating the common platform which partners will use for the actual solutions. My bet is that if they want to compete effectively against Microsoft’s Windows Azure and Amazon’s ever increasing set of Web Services they will have to move up the stack and provide more than the basic VM infrastructure. The question is how fast they can move into these new areas and how much the task of keeping all the datacenter partners happy will slow them down. Their main bets are on application compatibility – just re-use any VMs you have today – and broad hosting partner range. They are also hoping that their vCloud APIs (RESTfull web services) will enable broad ISV ecosystem. Common taxonomy: Software-as-a-Service (e.g. Salesforce), Platform-as-a-Service (e.g. Google App Engine) and Infrastructure-as-a-Service (e.g. Amazon EC2). APIs for storage, compute, network, and data. Right now, even when APIs are common across datacenters (e.g. with vCloud and 3tera) you still get locked into application vendor providing you these. Something like Red Hat’s Libvert abstract hypervisor API could help. Ruben from Enomaly pushing that through the Cloud Interoperability Forum. Other issues include identity (Erik thinks that OpenID has the biggest potential here while WS-* will probably be used by Microsoft only), and dependencies on particular cloud services. Pricing Complexity. How do you actually calculate the compute power provided and what is the Standard Processing Calculation unit? Work on virtualization benchmarks by VMware and Intel can help. Compliance issues: depending on the industry and application you might get to adhere to HIPAA, SAS70, PCI, or Safe Harbor (Rackspace is certified for the latter, European thing for datastorage). Overall, common standards should provide for interoperability, lock-in avoidance, fail-over scenarios, better tools for all, cloud bursting and multi-cloud applications – which will enable positive network effects and increase the overall market for everyone. Next we had Rich Wolski presenting his Eucalyptus project – an open-source clone of Amazon’s EC2 and S3. They currently have about 80 downloads a day. Download requires no registration so they do not know how exactly they are being used. The biggest installation Rich knows includes 260 nodes. They currently have 5 engineers on the project and drop monthly releases. At the moment they do not accept external contribution but might start doing that in spring when they stabilize. Finally we had Gerrit Huizenga – Solutions Architect from IBM and part of their cloud taskforce share his views on cloud computing. I was surprised that he was actually downplaying the role and newness of cloud computing as much as he could but I guess that is part of being from an established corporation with huge established software and consulting business. That is it for my day to day notes. I will also publish my summary notes once I recover from all the recent traveling and catch up on my email. Now that we had a few days to look at Microsoft’s Windows Azure it is time to compare it with other alternatives on the market. For our comparison we picked solutions from the biggest players in the market and potential to impact the industry in that area: Microsoft Windows Azure, Amazon Web Services, Google App Engine, and VMware vCloud. It is obviously too early to declare a clear winner here. Below is a feature-by-feature comparison table. Here’s a quick summary for each of them. Currently in early private beta but boasts an impressive set of APIs, great development story, and a promise for good enterprise integration. The most mature solution on the market and the first one to exit beta. Offers basic cloud infrastructure required (compute power to run virtual machines, storage, communication queues, database) and allows you to fully control your virtual machines and run your LAMP- or Microsoft-stack applications any way you like. Boasts the “drop your code and we’ll figure out the rest” approach taking care of all the scalability and infrastructure management for you. A pre-announced solution promising to let you simply take your standard VMware virtual appliances and run them anywhere: on-premise or in a datacenter of any provider supporting VMware’s infrastructure. set of limitations set by Google and submit the application code to them. run them on premise or at any partner datacenter. Access control services, workflow service, service bus. the solution but rather bundled. contacts, documents, pictures, spreadsheets, YouTube. care which development platform you are using on top of the base OS. Yes, have basic editing, local simulation, and deployment tools. Language selection limited to Python and Django. to have any integration with Google App Engine. What’s your take? Did I miss any features or comparison criteria? 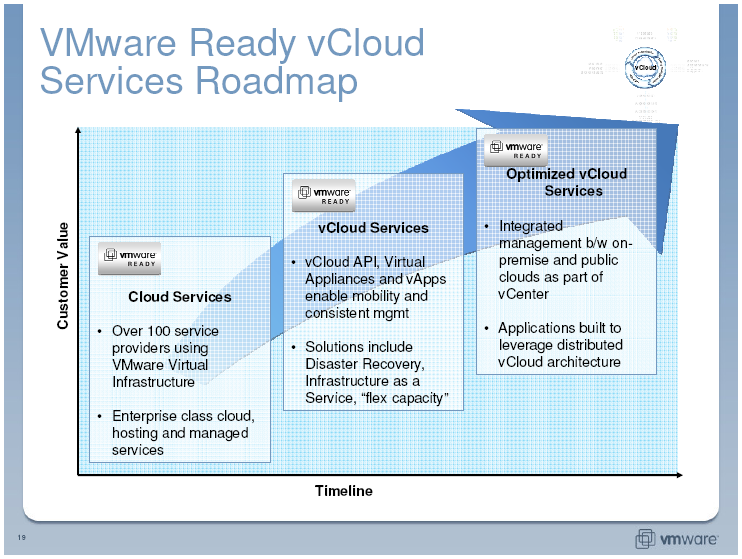 Is VMware’s vCloud – a killer for Amazon’s EC2 services? It definitely sounds like they are shooting to get into the same market. In a nutshell, Amazon allows you to have your (XEN-based) virtual machines run in Amazon’s data center and execute your application. This is great and makes Amazon a leader in that space today but there is a lock-in (as Richard Stallman was saying the other day) – all the APIs are proprietary and your application needs to be designed for EC2 and will only work there. There is of course the Eucalyptus project seeking to create an on-premise open source version of EC2 but at the moment it is more of an experiment rather than something commercially available for enterprise use. 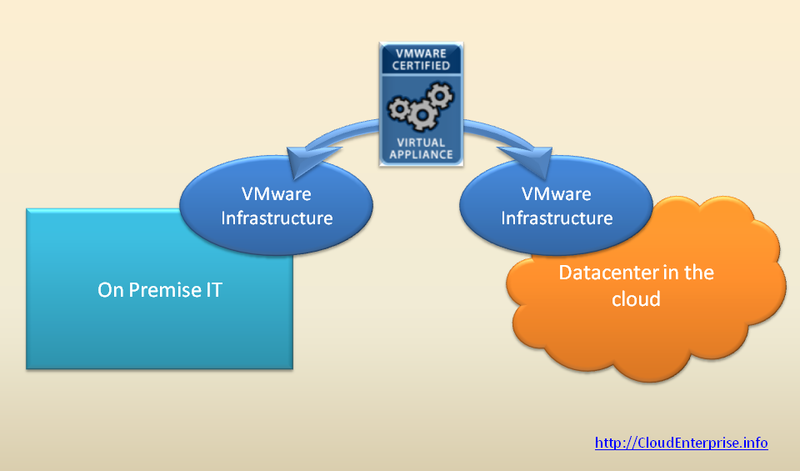 So you are kind of locked to the technology (VMware) but not to a datacenter provider. At VMworld, the scenario which was demoed had a company start a VM in external datacenter in addition to the ones they had on-premise to offload a part of the peak load. See Michael’s video here. This is obviously just one of the scenarios. The value of common infrastructure spanning across on-premise and cloud environments goes beyond that and provides the flexibility of using the best resource available at particular time for particular task, and be able to quickly get new resources when needed or reconfigure your virtual datacenter on the fly. The biggest problem with that, is that for VMware, this is more of a vision thing (despite a line-up of service partners promising to support the platform). It will obviously take time and execution to make it a reality.